I am generally not a big fan of white loaf bread, but there are certain foods that demand white bread, such as grilled cheese, banana sandwiches, summer tomato sandwiches with mayo and finally, pimento cheese, which was my comfort food of choice today. 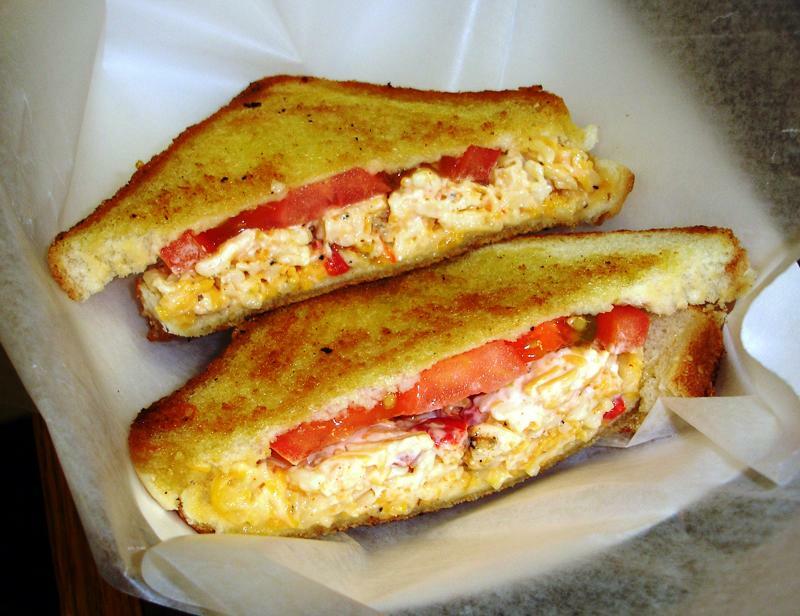 Besides, pimento cheese is served every year at the Masters in Augusta, Georgia, and Joel Olstein of TIME magazine declared that this is "The Year of Pimento Cheese!" For once, I can say I'm on trend. What is pimento cheese? If you have to ask because you haven't tried it, I am so sorry for you. The basic makeup of pimento cheese is shredded sharp cheddar cheese, mayo, pimentos, salt and pepper, blended until a lumpy paste. My favorite local pimento cheese is Conrad & Hinkle, of Lexington, NC. It is sold statewide in various stores (see their website). I buy it at Reynolda Farm Market on Reynolda Rd., Winston-Salem. Just PLEASE don't let your first experience be a bland, florescent orange, store-bought brand. It's simple to make. A great article & recipe containing garlic and pickles can be found on NPR: "Pimento Cheese: It's a Southern Thing". And then there's Paula Deen's recipe, which features cream cheese as well as Monterey Jack cheese. It's best on white bread and toasted (in my opinion), with tomato and bacon, and served with sweet tea. Or on a fat burger at Milner's American Southern Cuisine. Also great on Ritz crackers, of course. Enjoy, y'all! To kick it up a notch, I add toasted pecans to Palmettos hot/spicy pimento cheese. Serve it on some La Brea sour dough bread with avacado and sprouts and you have some real comfort food that I call Southern Fusion! How did I miss this comment? Sounds wonderful! I'll have to try it sans sprouts (not a fan). Thanks!